The Fund for Clinical Excellence honors Paul W. Seavey (1926-2004), a physician who treated several generations of the Rollins family. Dr. Seavey is pictured with Dr. David Roberts, director of the Paul W. Seavey Comprehensive Internal Medicine Clinic. A $5 million gift from the O. Wayne Rollins Foundation will expand the scope of the Paul W. Seavey Comprehensive Internal Medicine Clinic, support faculty physicians known as Rollins Distinguished Clinicians, and expand the Executive Health Discovery Database, which serves as a resource for research in general medicine. "The Rollins Foundation's gift will allow for an ever broader reach of Dr. Seavey's vision and mission of lifelong learning for general internal medicine faculty at Emory," says David L. Roberts, director of the new clinic and Charles F. Evans Chair of Internal Medicine. "Clinicians will benefit from more time and support for treating patients and teaching medical students and residents, and their research opportunities will expand as well." The Fund for Clinical Excellence honors Paul W. Seavey, MD (1926-2004), a physician who treated several generations of the Rollins family. Known as a doctor whom other doctors sought for their own medical treatment, Seavey believed that no one could care for the whole person better than the general internist, who by definition is in charge of every aspect of a patient's health. Because these types of doctors have fewer research and scholarship opportunities, and their productivity is usually measured by the number of patients that they treat, Seavey advocated for more academic resources and promotions for them. "It gives us great pleasure to honor Dr. Seavey's memory," says Amy Rollins Kreisler, executive director of the O. Wayne Rollins Foundation. "He was a dear family friend and an excellent doctor, but more importantly he truly epitomized the essence of an Emory physician. It is our hope that this gift will allow current and future clinicians to carry on his legacy." Based on the first floor of Emory Clinic Building A, the Seavey Clinic provides more individualized care of referred patients who need extended time and coordinated resources. The clinic is currently under renovation and is expected to open in August. The Fund for Clinical Excellence will enable the Emory Clinic to expand its comprehensive diagnostic center with a staff that coordinates medical services, tests and consultations, ensures communications with referring physicians and coordinates the Discovery Database. The $5 million gift continues a long relationship between the Rollins family and Emory University. Rollins philanthropy provided the core gift for the Paul W. Seavey Chair in Internal Medicine and supports the Rollins School of Public Health, Candler School of Theology and construction of the new Health Sciences Research Building. O. Wayne Rollins, a native of north Georgia, was a self-made entrepreneur and a steward of the free enterprise system. He and his brother John participated in numerous successful business ventures, including radio and television stations, cable television, oil field services, truck leasing, boat manufacturing, real estate and—most famous—the 1964 purchase of Orkin, Inc., the first documented leveraged buyout in U.S. business history. 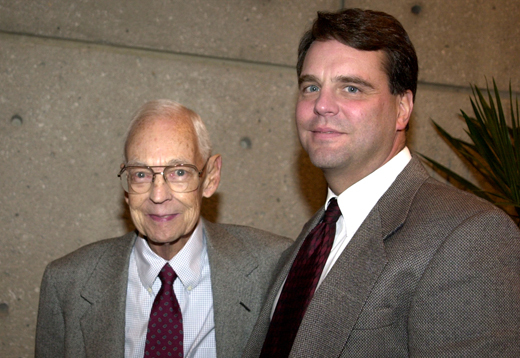 Following his death in 1991, his sons, Randall and Gary Rollins, have continued to build the Rollins companies. The O. Wayne Rollins Foundation, created in 1967, continues its mission to improve the physical, mental and spiritual well-being of people, predominantly in the state of Georgia.